After our eating that amazing fried egg reuben at Blue Sky in Bethlehem, G & I hopped in our car and headed east to New York. The drive itself wasn’t as bad as I thought it would be–we didn’t hit any traffic and even driving across Manhattan wasn’t too bad. A little slow, but nothing compared to our 1/2-a-mile-in-2-hours-nightmare on the way back to VA. Why you have no option but to drive through Manhattan to get to Brooklyn in beyond me, but I’m sure there’s a reason for it. A demented and strange and evil reason. As soon as we got to my friend’s block, we parked and headed out towards the store his girlfriend, Lila, works at–The Meat Hook/Brooklyn Kitchen–to meet her and ask for directions to the right part of town. Let’s talk about The Meat Hook for a minute. It’s amazing. It’s mindblowing. And you don’t even have to eat meat to love it. 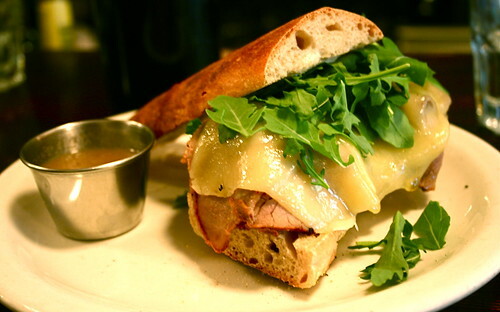 Really–it’s just a cook’s paradise. Sure, there’s really cool cuts of pork-beef-chicken, but there’s also an amazing organic-fresh-local produce section that Lila manages, the niftiest kitchen tools imaginable, and some great dry goods as well. Let’s just say that when I returned on Sunday before we left, I did not walk away empty handed. Oh! And The Meat Hook has a sister store, Vine Wine, that sells not just a great selection of wine, but also small batch fancy pants liquor. Unaged whiskey? Oh, I bought some. Anyways, so Lila (David’s girlfriend), pointed us in the direction of Bedford Ave, so we set off in search of drinks and something to snack on. Not hard. But a giant apocalyptic storm decided to roll through. Umbrellas or rain gear? Oh, we left those in the car a mile and a half away. Oh well. So G & sprinted towards Bedford and settled in at the The Bedford, a quiet, cool, dark haven, to have a few drinks. We eventually ended up at The Rabbit Hole for a lunch-dinner snack and drink, but ended up getting stuck at a not-delicious place for the worst of the downpour. Luckily, even through the drink was terrible, the espresso was strong, and our seats on the patio did not get soaked, so we could at least watch the storm finish up and then see the giant rainbow. Intense! After the storm, everything turned normal and we met up with David at McCaren Park to watch Beruit play. No pictures (whoops), but a great show. 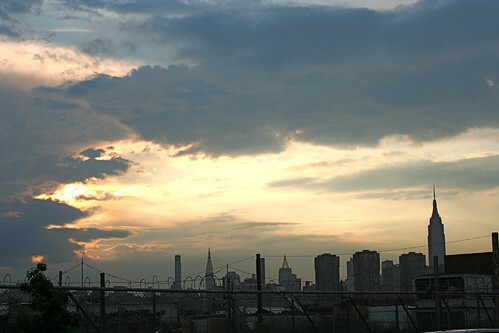 Plus the cool weather was killer mixed with the sunset over the city. Sharon van Etten opened, but we missed her in the walking back and forth to pick up our tickets from the car, but Beruit played a solid and exactly what I wanted to hear show. It’s always nice to catch a band after years of wanting to see them. We grabbed a late dinner (and more drinks!) at the Roebling Tea Room, but that’s another post soon to follow. The grand finale of the night, though, was Crif Dog. I love hot dogs, it’s true, but Crif Dog blew my mind. I wasn’t craving anything super crazy, but when David pointed out the bacon-wrapped hot dogs, I knew I needed to try one. So. Glad. I. Did. The bacon-wrapped dog came with sour cream and avocado. Sound weird? Trust me, you should try/make one. It was epic and I could definitely go for one right now. 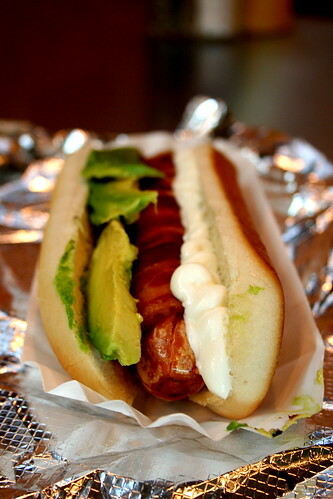 Even a veggie bacon wrapped veggie dog with tofutti sour cream and avocado sounds awesome. Mmm. 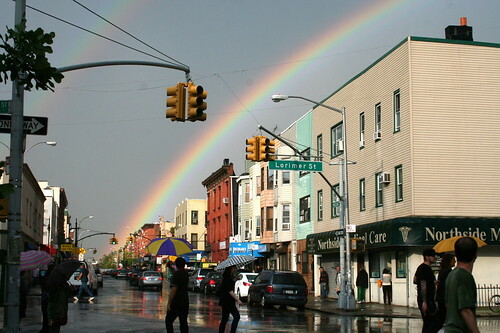 Brooklyn steals my heart every time I’m there and between the rainbow and the Crif Dog, it’s safe to say it lived up to expectations. Bacon-wrapped hot dog–do it. Im down for the vegan veggie dog! Looks like a blast, and I love the great looking hot dog. Crazy rainbow! It’s 8:50 in the morning, but here I am wanting a hot dog after seeing your picture and hearing the description. Wonderful photos—the rainbow one is amazing! What a great view and photo of the rainbow. Sounds like a great visit! You’ll have to share your experience with the whiskey – I have tried something like it on a distillery tour (to taste the stages of the final product) and I can’t say I’d want to buy any. That and following your link and seeing the comparison to grappa, which again is just beyond me. Okay, this might be complicated, but can you please (you must) send me about a dozen bacon wrapped hot dogs to Saudi Arabia. If they can’t go by mail, please oh please hop on a plane. I need those! Seriously gorgeous pictures, here! The sky is just stunning.